Had a bit of an accident this weekend. I was continuing the epic job of rewiring the house and removing the ancient knob & tube wiring. Saturday found me in the 110+ degree unfinished attic digging through ancient insulation to find and trace the circuits for the second floor lights & plugs. 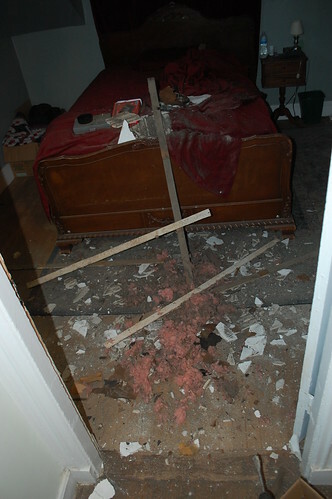 I was balancing on the ceiling joist and a collection of old boards when I mis-stepped and put my foot through the ceiling of my bedroom. 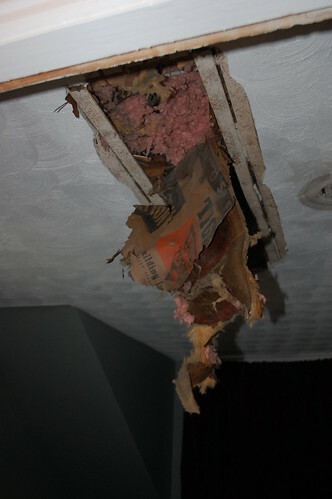 Fortunately I caught myself before all of me went though the ceiling, but I was still left with a 10″ x 48″ hole with the plaster spalled off around it. And where it all that plaster, lath, nails, dust, dirt and ancient insulation end up? Why on the bed & carpet of my bedroom of course. As frustrating as it was to have just messed up like this, the worst parts was I still had a bunch of half-wired circuits and hacked up old wiring in the attic. So I had to ignore what I’d done and keep working up there so I’d have the lights and working plugs needed to be able to clean this up. I don’t have photos, but as of now there are nice new lights in the upstairs bathroom & my bedroom, the one in the bathroom now even has a switch instead of a pull-cord. The hole now has a piece of drywall screwed over it, and will eventually be re-plastered(when I feel like plastering over my head and wearing half of it). 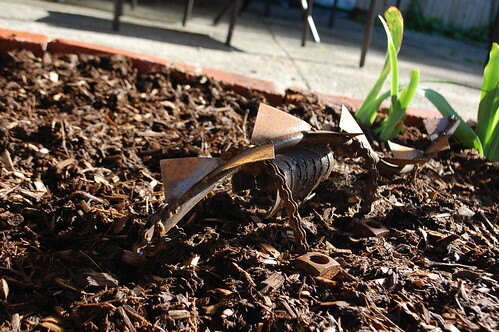 Spike the Tetanusaurus, who I created in a welding class, is currently guarding our flower bed. The mudroom in our house is tiny, about 3′ x 3′, and there isn’t a light in there. It isn’t bad now that I’ve opened up the doorway to the kitchen, but it is still dim, especially if you are trying to find something in the closet. I wanted more light in there, but did not want to add a ceiling fixture as the space is so tiny it seemed like anything would overwhelm the space. 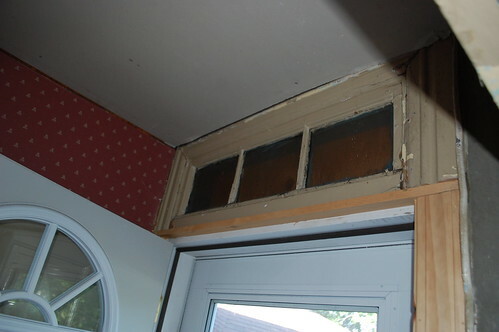 In the mudroom however there is this old transom window. 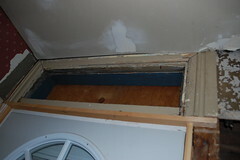 This used to be part of the back door, and was on the outside of the house where it let light into the mudroom. 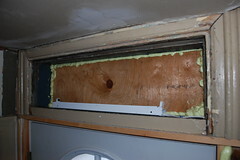 When the prior owners replaced the back door and sided the house, they covered the transom from the outside with plywood, but left it in place in the mudroom. So I decided to use it to my advantage. 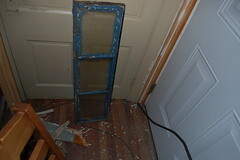 First I pried the transom window out. It had been painted dozens of times and the glass is falling out, but it is still essentially intact. I will be properly restoring it in the future when I start re-glazing all the windows in the house. First thing was to seal the edges of the plywood with some spray foam, then I drilled a hole through the side of the transom and ran a wire to where I was rewiring the switch for the outside light. 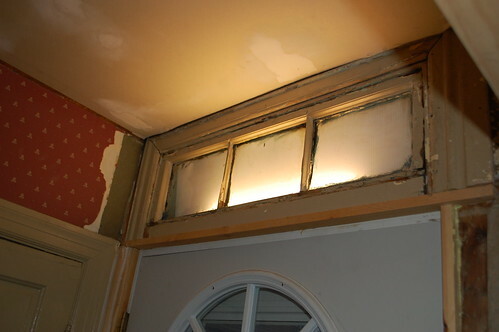 Then I installed a cheap fluorescent light in the transom opening. This light won’t be visible when the transom is in place, so I could use a cheap ($8 w/bulb!) fixture. 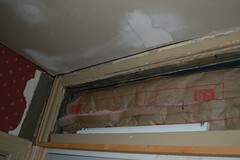 Then some insulation was added behind the light so there would be more than a layer of plywood keeping the heat in here. A piece of white Chloroplast was then added(visible in the next pic) to hide the insulation and help bounce the light out the transom. The semi-final result is as below. Obviously there is still painting to be done, but you get the idea. The light itself is hidden, so all you can see is the glow shining out of the transom. It does an excellent job of lighting the mudroom, and makes use of an otherwise useless oddity of the house. 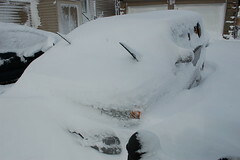 Feb 8th Blizzard, in pictures. 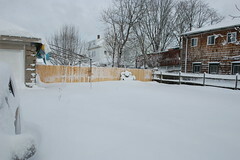 We, like all of New England, were hammered by a blizzard on the 8th. Snow was falling lightly when I left for work at 8am, and by the time I was coming home(early) at 2pm it was falling pretty fast. 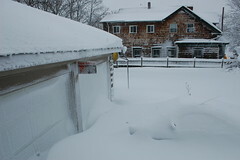 Not long after that the wind really picked up and more snow was going sideways than down. Power flickered a few times and finally cut out for good about 9:20pm on Friday. We sat around reading by lamplight, and staying under a blanket to keep warm. 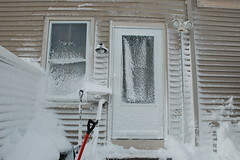 At one point that evening I considered clearing the accumulated snow, however a quick look outside told me it would be a fools errand. 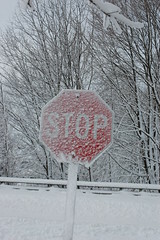 The wind was whipping it around so much there would likely be no sign it had happened. Instead we went to bed early and burrowed under a nice deep stack of blankets & comforters. 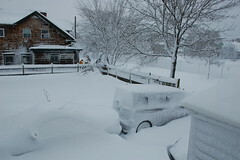 The next morning the wind and snow had subsided, but the power was still out. It was also 49deg in our living room. 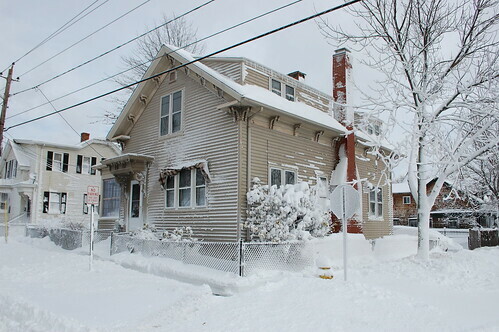 We spent the day alternating between shoveling out and keeping warm with pans of boiling water on the stove(thank goodness we converted to gas before we moved in). Electricity finally returned about 6pm on Saturday. We were without power for 21hours, which was pretty good compared with some people(a co-worker was without power or water for four days). 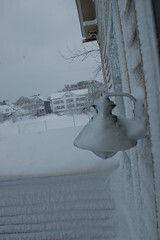 Most of the house looked like it has been sprayed with a snow gun. While House Improbable isn’t in the direct path of Hurricane Tropical Storm Sandy, I’d rather over prepare and look foolish than under prepare and have broken stuff. 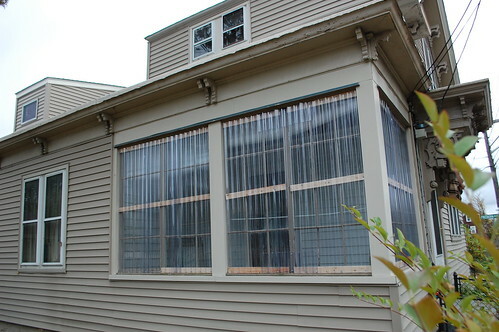 The side porch of our house is in rough shape, much of the glue holding the muntins together is gone, some of the wood is shot and several glass panes are cracked or broken. 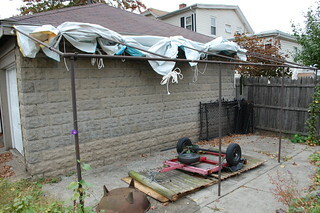 Since this wouldn’t stand up to a strong breeze, we knew a hurricane would likely wreck havoc upon it. So after a Home Depot trip, we added wood supports across the outside, then screwed corrugated PVC to that. 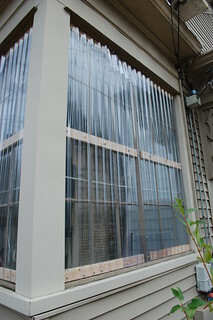 It doesn’t look horrible, should protect the fragile windows, and leaves the porch usable. 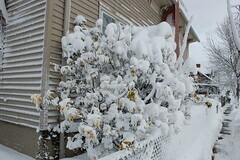 Assuming this survives the storm as well as I hope it will, it’ll likely stay on the windows all winter. With any luck it’ll keep the porch warm enough that the ever patient girlfriend can keep her plants out there. The other prep included tying up the billboard patio awning(one day I will write the post about making this, I swear), and using the wee trailer to weigh down some plywood & fencing I had sitting in the yard. Then all that was left was to stuff the patio furniture & trash cans in the garage and we are ready for the storm. …and already it is taking over my brain. 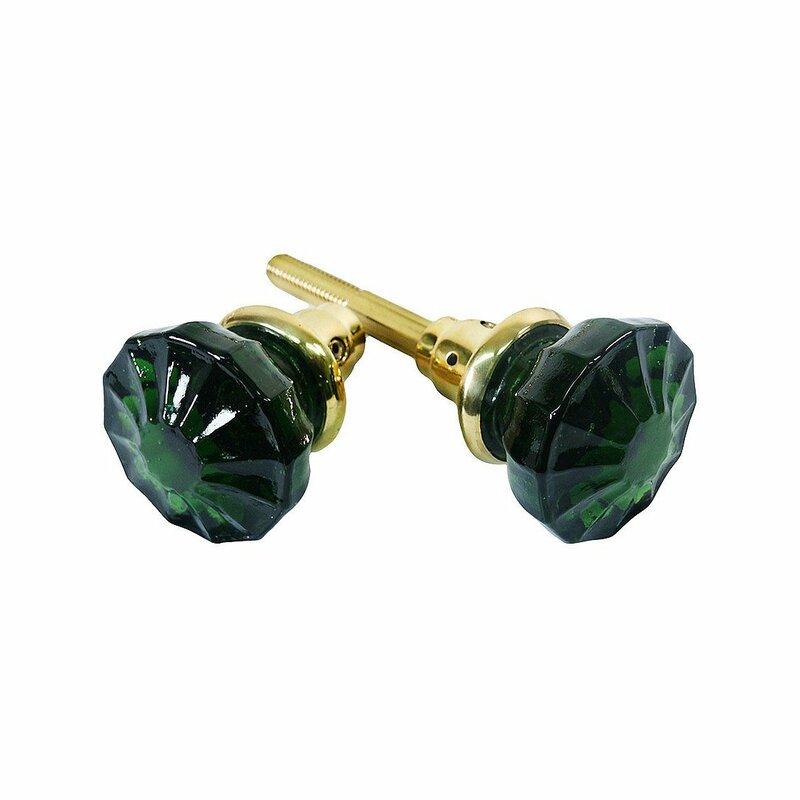 Today’s obsession is these forest green glass door knobs. Look at them. Just look at them. You’ve never given door knobs a thought? Oh, you’re one of those normal, well-adjusted people. Aren’t you?